Often, people suggest teachers to me that they think I may want to have teach for Bellissima Art Escapes. Pamela Caughey is one of these referrals. She was also pretty relentless in following up - as a former marketer, I had to admire her tenacity. I remember being struck at how she recovered from losing her house and studios to fire and how she used the embers in her new encaustic work. 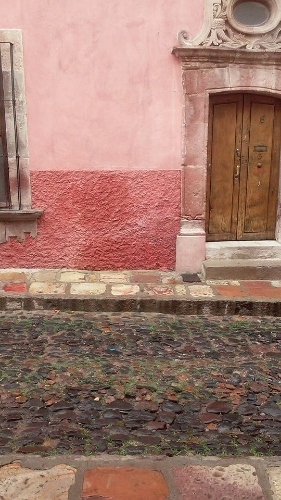 I signed up for her newsletter and now we are planning a workshop to San Miguel de Allende. Pam is very prolific, teaching workshops around the world, and from her studio in Montana. This picture, of course, taken on a day she wanted to share a pristine look of her busy studio. She works in both encaustic and cold wax mediums. I'm intrigued after watching her more than 30 videos on You Tube, by her approach to mark making and personal color. As she says, this method can be applied to acrylic painting, cold wax, oil painting, and encaustic. We will explore cold wax in San Miguel but you can also just paint in acrylic. You can see more of Pam's work on Instagram and Facebook. Take a look, you will love what you see. You can read more about the workshop here. 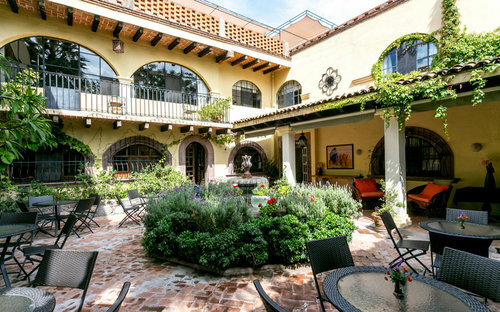 We will be staying at our favorite B&B, Casa de la Noche and will visit some of our favorite restaurants and chefs. As you may know, the food is as important as the art on a Bellissima Art Escape. Culture + Life Experiences + Food! This workshop is for all levels of artists. Pamela will spend personal time with each artist to answer questions and to guide you through your discovery of your own "personal color." San Miguel has been voted the number one place to visit in the world by Conde Naste. It's pretty magical as I suspect this workshop will be, too. We still have room for a few artists, won't you join us? Go here to find out more about this workshop of Powerful Design and Personal Color with Pamela Caughey.